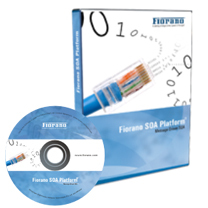 Download a 45-day FREE Evaluation copy of Fiorano Platform and FioranoMQ. Here you'll find the latest product releases of Fiorano Software and more. Prior releases are available for existing customers requiring additional copies of previously purchased software. Use of all our software is subject to the Fiorano End User License Agreement. If you are a US Federal or State Government entity ordering under the GSA contract please click here for the EULA. Fiorano® platform combines an ESB, B2B Integration and API Management into a powerful platform for deploying Digital Business solutions. FioranoMQ is the world's first grid-enabled, peer-to-peer JMS messaging platform, with powerful and unique features including dynamic routing, distributed debugging of message flows, dynamic deployment of JMS client applications, unbounded scalability, direct invocation of standards-based JCA components and unparalleled ease-of-management with JMX standards. For pricing information or to buy the software Email us, we will contact you! Request a standard licensing agreement for enterprise licenses, OEM etc.